It was gathered that to consider and pass the N242 billion request by President Buhari would take the National Assembly at least one month to conclude. “The request by President Muhammadu Buhari is not just a single line item that would just require a one day sitting. The request has variety of committees that would be involved, including the Appropriations, Finance, INEC and other Ministries, Departments and Agencies (MDAs). “It is different from a situation whereby the president is asking for an increase in the size of the budget through a change of benchmark. The assignment required in respect of that letter from the president is not something that can be done in one day,” the source said. According to the source, the National Assembly cannot achieve anything even if it was reconvened this week, as it has to be passed to the committees, which in turn would have to meet with he various ministries, departments and agencies (MDAs). “Besides, there is another issue that has to do with the constituency projects. The letter is requesting the lawmakers to remove funds from their constituency projects and use the same to fund INEC. Remember that the constituency projects are not one line items in the budget. You can’t imagine how long it would take the Appropriations Committees to sort out that issue with the MDAs,” another source stated. “Reconvening the National Assembly will not really work. It would mean that you want to keep the lawmakers around for the next one month, which defeats the idea of the annual recess. The letter by the president is not just requesting for an increase in benchmark, which can be handled in one day through Senate or House resolution. Treating the letter will take two to three weeks,” the source said. Another source close to the leadership of the National Assembly further stated that the logistics of securing a quorum of either the Senate or the House was becoming increasing. “Many of our colleagues have travelled for Hajj. Many are in their constituencies battling the challenges of reelection. If you check even with the APC right now, they can’t get up to 30 senators and next week is Sallah, Arafat is on Monday and you will have holidays,” the source added. 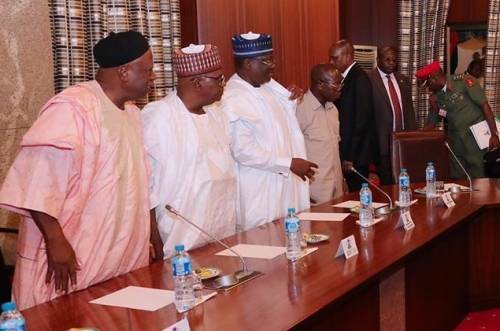 The herdsmen in a crucial meeting on more killings. Useless and heartless Killers . Wait until the killer herdsmen visit your family . You chameleonic Yoruba. Shouting hosanna today Crucify him tomorrow. It is obvious now that your Mr. INTEGRITY is more corrupt than the good man Good luck. Another four years for this your inactive buhari will spell doom for you in particular.